Long King says it can develop a bus body to suit any need. 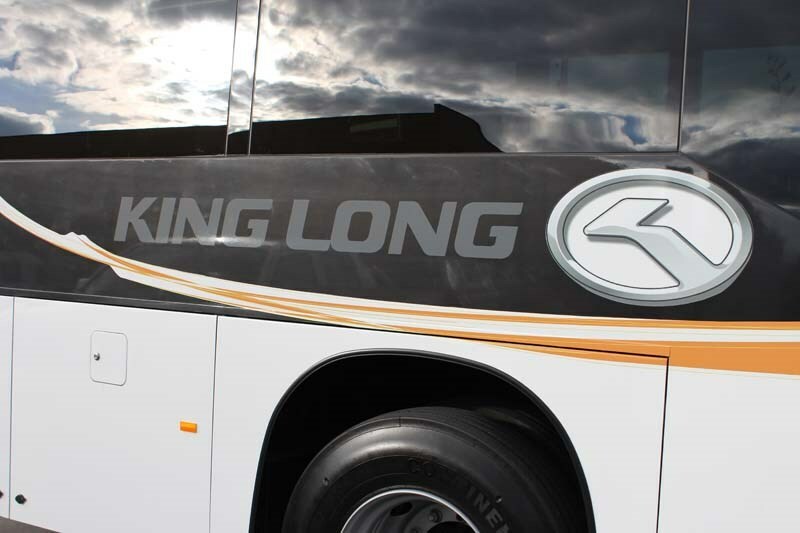 Long King supplies 80 bus and coach markets globally. 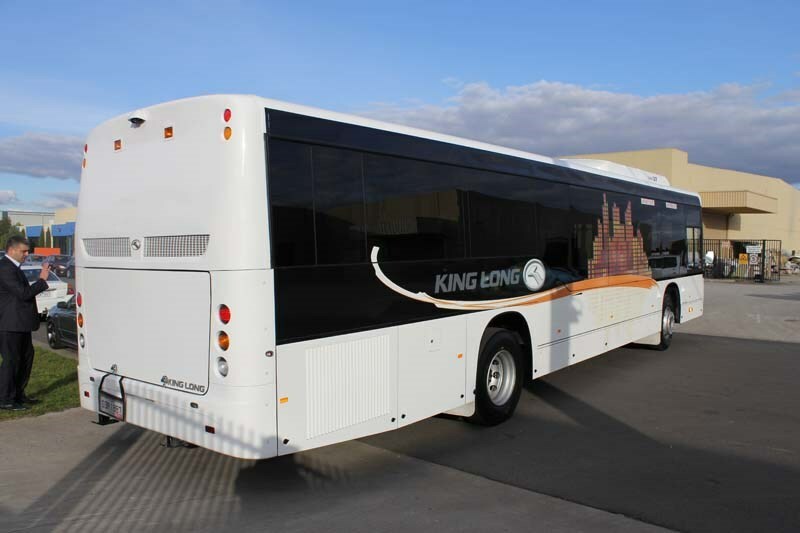 King Long’s 6122 urban low-floor is aimed at the busy Sydney route service market. 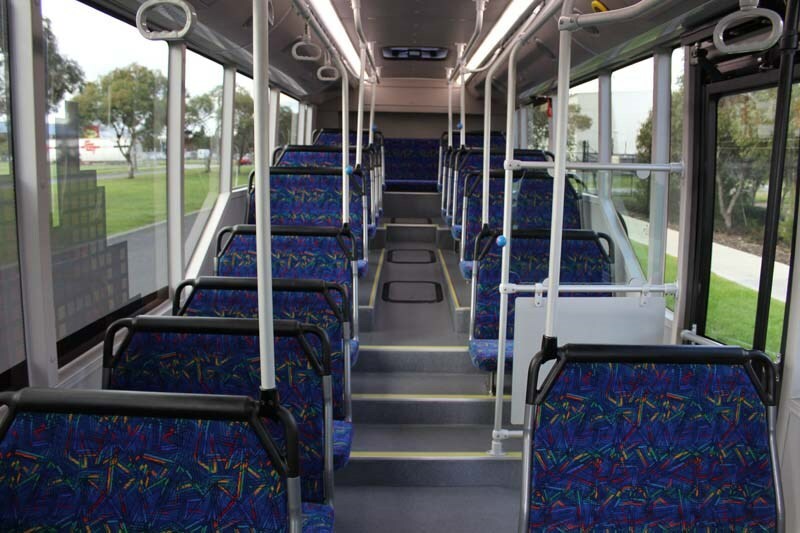 The seats (as well as air conditioning) are made in Australia, for better service and repairs. All aboard the King Long bus, with Gary Worrall at the helm. The King Long 6122 steadfastly avoids sharp edges and harsh angles. The Long King is built on a MAN A69 18.320 ultra-low-floor chassis. It seats 49 passengers, including six ‘flip up’ seats. The King Long 6122 bus goes for a workout on Melbourne’s northern outskirts. The road feel translates into a smooth ride for passengers as the driver can judge how much steering lock is required through corners. The rear end now comes in three panel pieces (instead of one), for easier maintenance and replacement. 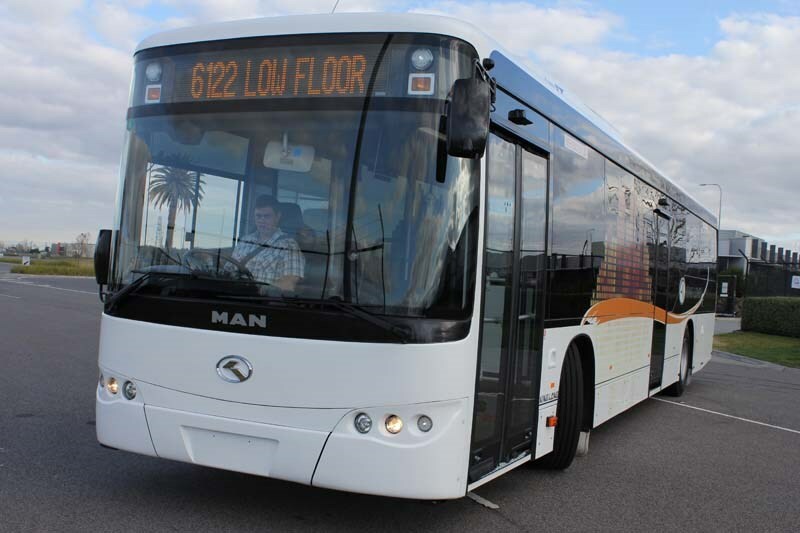 The Long King 6122 for the test drive was mated to the popular MAN A69 chassis. The Long King 6122 bus in its ‘racing stripes’. 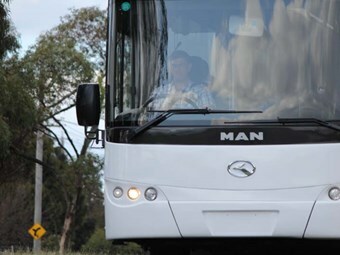 Chinese-built buses and coaches are already popular with Australian operators. Gary Worrall put the 6122 low-floor through its paces. 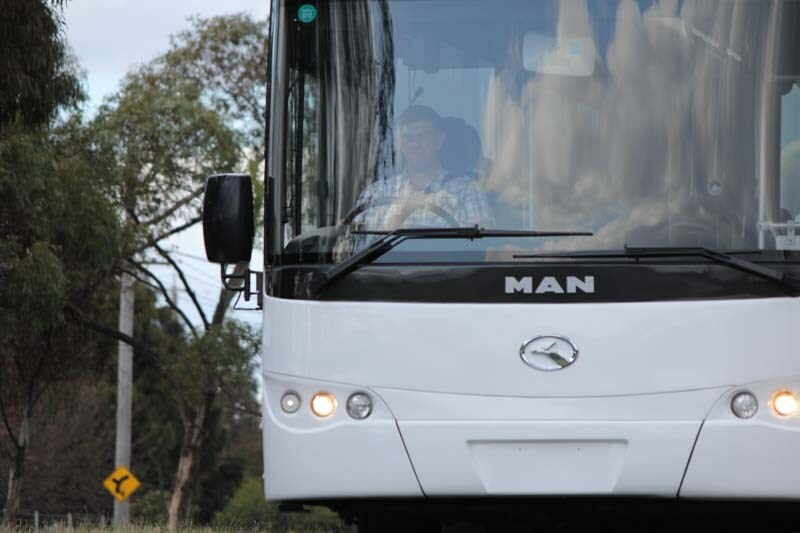 Not all that long ago, the thought of a Chinese manufacturer supplying route buses for major Australian capital cities was a pipe dream at best, with stories of strange looks and poor build quality discouraging operators. 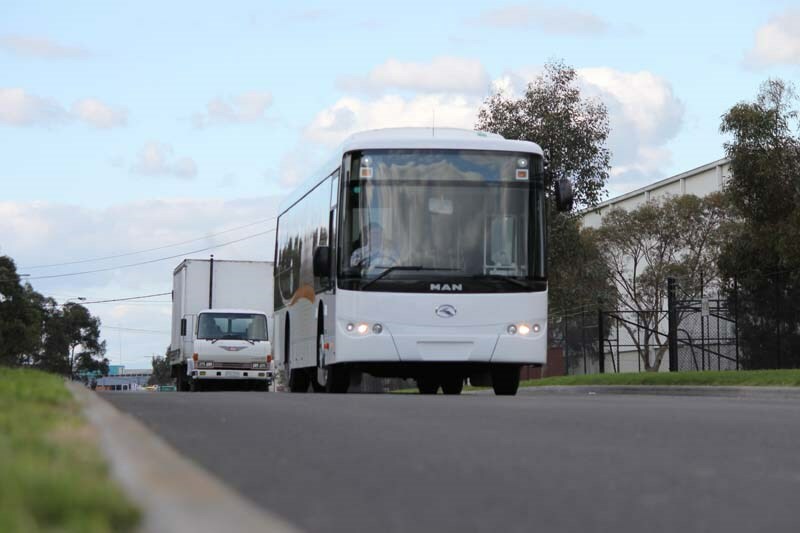 Times change, and time changes everything, as the saying goes, including the bus market, with King Long now an approved supplier to the New South Wales bus market, with the 6122 model the standard bearer for a new generation. Distributed by Melbourne-based Heavy Vehicles Australia (HVA), King Long is an amalgam of East and West, with Chinese design and manufacture, but responsive to the needs and requests of its importers. 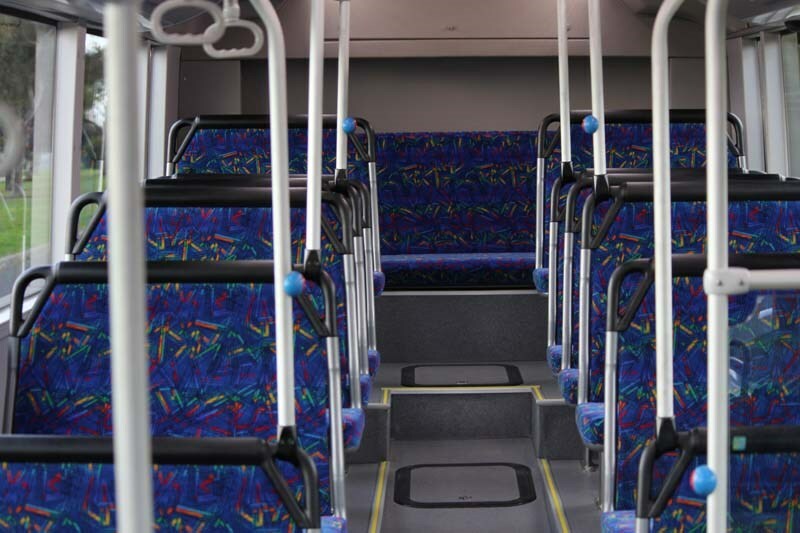 Available on a number of European, Korean and Australian chassis, the 6122 meets the demand for 12.5m urban buses, seating 49 passengers, including six 'flip up' seats in the wheelchair area, plus a full complement of standing passengers. While domestic market products may still look a little unusual to Western eyes, Chinese designers have learnt the lessons of other Asian manufacturers and opted for a global 'face' welcome in export markets. The result is an innocuous front end that will not stand out in a depot full of buses as identifiably 'Chinese', the downside being an inevitable blandness of design with manufacturers losing individuality in an attempt to not upset or offend. The 6122 steadfastly avoids sharp edges and harsh angles, instead the front end is a series of gently curving surfaces blended through the single piece wraparound windscreen. The roof line also rolls over from the upper edges of the body, resulting in fluid shape that gives the impression of gliding along the road, even while it is stopped, in a visual illusion similar to a sports car that looks 'fast' even while standing still. The front and rear bumper sections are moulded in three pieces, with the outer sections able to be removed individually if required, allowing for rapid repair or replacement of damaged panels or blown headlight and indicator globes. All lower panels are aluminium for resistance to chipping and cracking while still offering ease of repair, while aluminium composite sections are used on the waist panels for lightness without sacrificing strength. The rear bumper offers plenty of ground clearance for creeping over drains and driveways without engaging the skid plates, to help with this the rear panels angle upwards to improve rear clearance. The engine cover is big, offering plenty of space to access the engine and ancillaries, there are also lift-up side panels improving access to the air cleaner and air-conditioning units. All new King Long low-floor bodies use full multiplexing of body electronics for improved reliability and serviceability, the electrics are housed in a separate bay allowing work to go on without impeding engine or transmission servicing and repairs. Although not an issue for operators, the King Long follows the modern trend of eschewing rear destination boards or even route number repeaters, while this is one less item to be maintained, word-of-mouth from passengers is the lack of a rear board makes it hard to identify the correct bus at a crowded platform. Fit and finish is generally good, although some panel gaps are variable, particularly on the longer sections, however this should improve over time with feedback from the local arm on customer expectations. 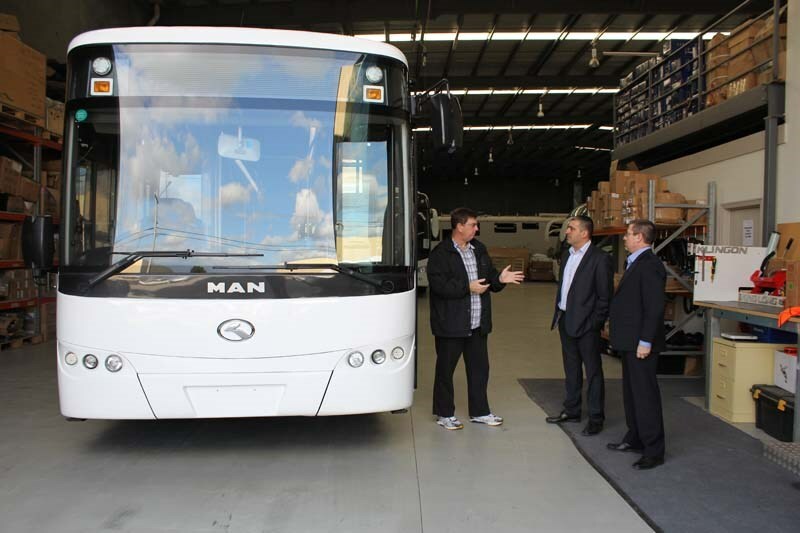 The test bus is built on an MAN A69 18.320 ultra-low-floor chassis, which is a proven unit in the hands of many operators around Australia. The engine is a 10.5-litre six cylinder producing 235kW and 1,600Nm of torque, driving through a 6-speed ZF Ecolife automatic transmission featuring an integrated retarder, although MAN also offers the option of a Voith 4-speed auto gearbox, also with integrated retarder. In line with European practice, and recently adopted by Victorian authorities, the A69 is rated to 18-tonnes on the 4x2 configuration, however operators in the rest of Australia must make do with a 16-tonne gross mass restriction. The chassis is also fitted with electronically controlled air suspension, with two front bags and four at the rear, which provide the lowering and kneel functions, as well as a 'raise' setting for negotiating washouts and steeply inclined driveways. Like the outside the 6122 is generally well put together inside, although there were a couple of instances of poorly finished vinyl trim on the A-pillar, however the overall standard is high. The single piece screen is a driver's delight, offering a clear field of view stretching from below the level of the dash to almost the roof and unimpeded by centre dividers. The A-pillars are thin enough to not cause a loss of vision even on suburban roundabouts, which also prevents pedestrians from adopting a 'cloak of invisibility' when approaching the bus from the forward quarters. In kneel mode, the 6122 sits down low for ease of passenger ingress and egress at kerbside stops, there is also a driver-operated fold out ramp in the forward vestibule for wheelchairs, prams and walking frames to bridge the gap. The aisles are wide, with plenty of room for passenger access to facilitate speedy loading and unloading on high-occupancy routes, with a second exit door in the mid-section. The driver's station is well laid out, a blend of Teutonic efficiency courtesy of MAN, and well placed additional panels from the King Long designers. The main instrument panel is standard MAN territory, with large dials for engine and road speed, supported by smaller gauges for air pressures, fuel and temperature, while a swarm of smaller warning lights occupy the centre panel, under the LCD gear position indicator screen, for ease of reading. This panel is flanked by the chassis control switches on the right, including air suspension, lights and the gear selection rotary switch, while the left side is the body control functions, with door open and close, interior lights and saloon air-conditioning. 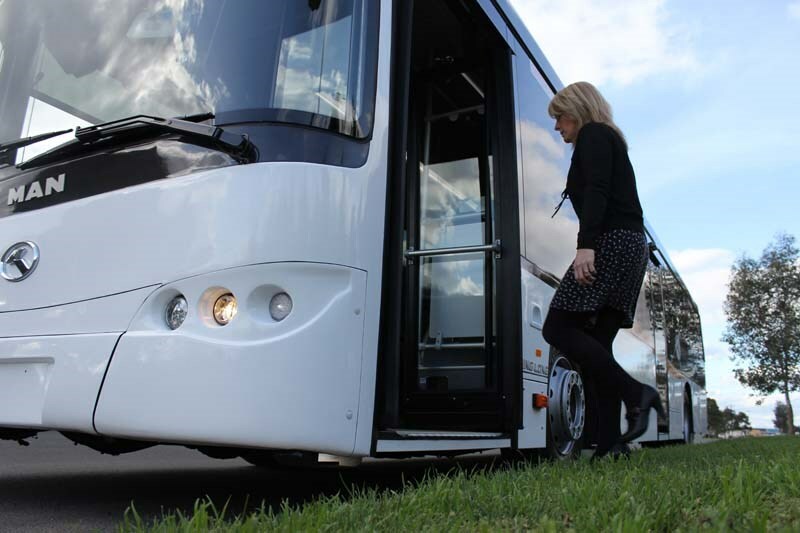 The body switches can also be customised to suit specific fleet requirements, to help reduce driver confusion when moving between buses in large fleets. The driver gets an Isringhausen air-suspended seat with integrated three-point seatbelt, which can be adjusted to suit a variety of body sizes and shapes. Also fully adjustable is the steering wheel, which can be set for both height and reach so that the driver has full view of not just the windscreen but also the complete dash panel. The accelerator and brake pedals are widely spaced while the left side has plenty of room for the driver to sit comfortably. There is also a full-height protection panel, sadly a necessity in the modern era, as well as latchable door to seal off the driving station. For early morning or late afternoon shifts the 6122 also features sun blinds for the windscreen to reduce glare, adjustable to suit driver needs without cutting out the view of the road. The external mirrors are high-mounted, this is a personal preference and suited my driving style, and offer an excellent view down both sides of the bus, virtually eliminating blind spots. Despite the 1,600Nm torque output of the MAN D 2066 engine, the chassis damps out excessive noise and vibration, there is a slight thrumming through the body on start up, however this settles into a barely noticeable rhythm as the engine warms. The rotary gear selector is almost a disappointment, so easy is it to engage 'Drive', with the doors closed to release the transmission lock and the truck-style park brake released the 6122 glides forward to greet the road. 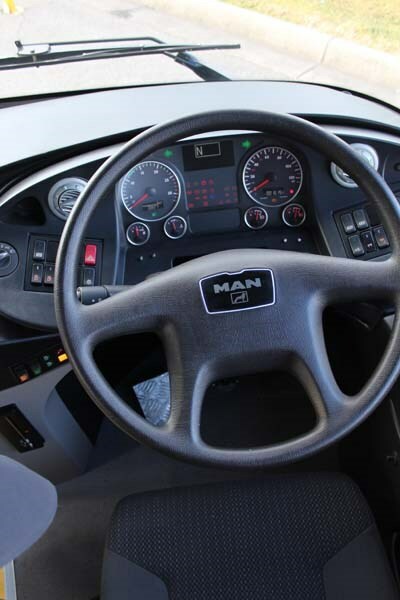 MAN fit ZF steering as standard, this is an excellent unit with good road feel for a forward control vehicle that has virtually no free play at dead ahead, allowing the driver to accurately pick a line into a corner. The road feel translates into a smooth ride for passengers as the driver can judge how much steering lock is required through corners, which also helps extend steer tyre life as the shoulders are not abraded by excessive driver inputs. In-gear acceleration is good, the engine delivers peak torque between 1,000 - 1,400rpm for smooth take-offs and allows the driver to maintain road speed in fast flowing traffic. The ZF Ecolife is well-sorted, providing smooth shifts for constant acceleration, important when repeatedly pulling out from the kerb on suburban routes, while downshifts for rolling starts or hill climbs are crisp, with no noticeable interruption to power delivery. Although it can be modified to suit customer wishes, the default setting for the retarder is via the brake pedal, so that the driver must actively press the pedal to engage braking force. While the retarder is highly efficient and offers plenty of brake assistance, including transmission downshifting for peak braking effort in emergency situations, it requires the driver to shift pedals, rather than being able to engage the first stage by simply reducing pressure on the accelerator. The combined effort from the retarder and the electronically triggered, air-operated all-wheel discs is impressive, the A69 also features traction control and ABS for enhanced safety, the bus pulled up straight repeatedly under full pedal applications. The six-bag air suspension copes well with a variety of road surfaces, while the body is free of squeaks and rattles, and simply absorbs the worst Australia's local governments can serve up. Despite some minor fit and finish issues, the 6122 impresses, with a high level of passenger comfort, while the choice of known chassis suppliers helps remove concerns about mechanical longevity. 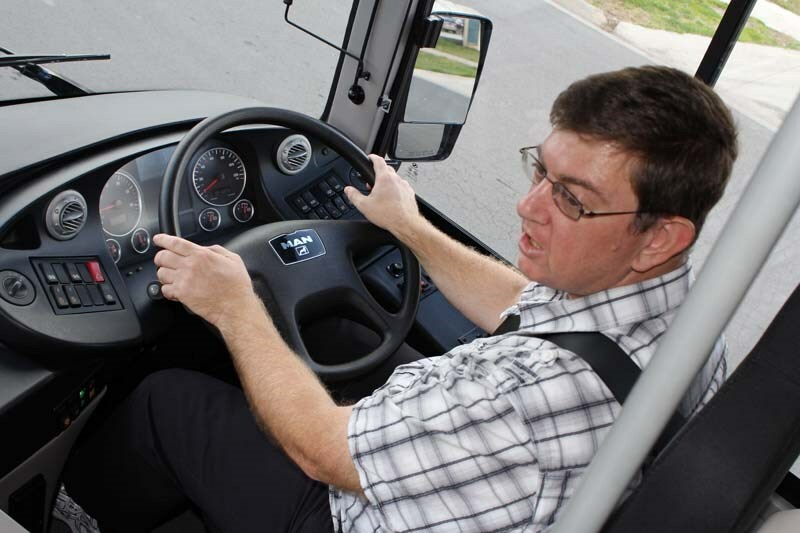 For fleet operators seeking a bus that is simple and predictable to drive, the 6122 offers both, so even inexperienced drivers feel comfortable and in control, a big issue in an era when experienced drivers are hard to find. King Long also cleverly opted to fit Australian seats and air-conditioning, providing access to well-established service and repair networks. While there will undoubtedly be some operators who are unsure about choosing a Chinese bus for high-volume route work, this is well worth a look. 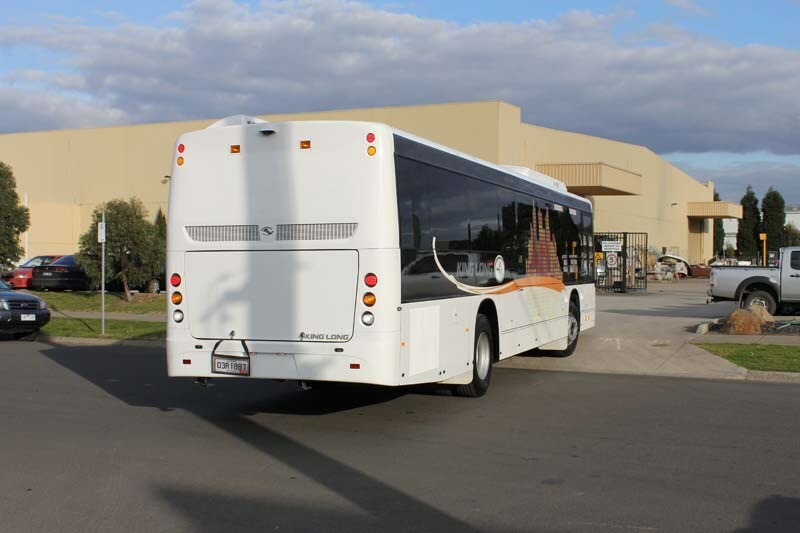 Find King Long buses for sale. Search for new King Long specs.